I’m the first to admit, carrots don’t get me too excited. However, liberally coat them with punchy spices and douse them in a creamy and zingy buttermilk dressing and yes, now we can talk. Parboiling the carrots before you grill them ensures they’ll be tender without burning the spice mixture. 1. Combine all the spices in a bowl. 2. Bring a large saucepan of salted water to the boil. Add carrots and cook until tender but still crisp, about 4 minutes. Drain and transfer carrots to a medium bowl. 3. Add oil and spice mixture and rub carrots to coat. Cover and leave to marinate, at room temperature, for at least 15 minutes or overnight. 4. Meanwhile, whisk all the buttermilk dressing ingredients together in a small bowl and season to taste. 5. Heat a barbecue or grill pan to a medium-high temperature. Grill carrots, cut side down, until they are lightly charred and caramelized, about 4–5 minutes. 6. 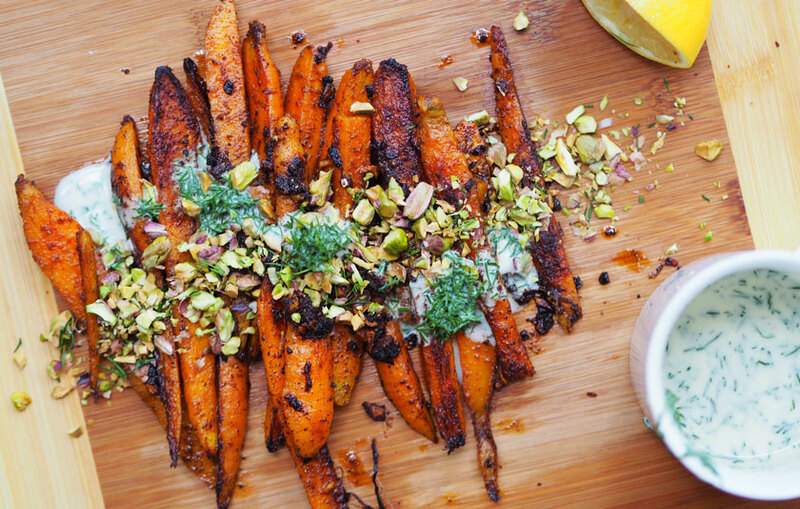 Arrange carrots in a bowl, drizzle with dressing and scatter with pistachios. *If you can’t buy buttermilk, whisk together 125 ml (4 fl oz) full cream milk with 2 teaspoons of lemon juice. Allow to sit for 5–10 minutes or until the mixture thickens slightly and small curdles form. It won’t be as thick as buttermilk, but the taste will be the same.